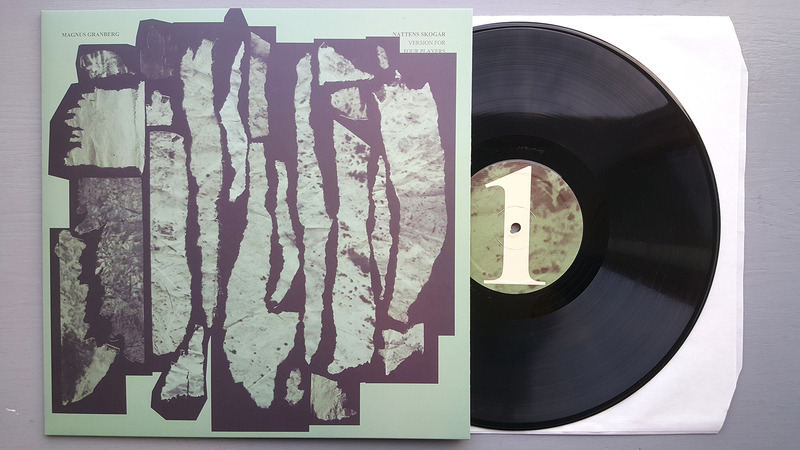 For the first time available here on vinyl, Magnus Granberg music has gain a good reputation through the years and his excellent serie of publications by the british label Another Timbre and his Skogen group. This time on a small, quartet, formation, Magnus Granberg, on prepared piano, and violinist Anna Lindal are joined by Cyril Bondi and d’incise, from the Diatribes duo and many more, whom where already part of the 10tet recording of « How Deep is the Ocean, How High is the Sky? » in 2015. « Nattens skogar » is a piece of evoluting materials, fragments, of melodies, of multiple pulses, of tones and soft noises, in a seemingly perfect balance, with this inimitable melancolic touch and sens of endless time we often find in Granberg’s work. It was originally intended for the Swedish ensemble Skogen and its materials are partly derived from two pieces of quite decidedly nocturnal musics, Erik Satie’s nocturnes, and Thelonious Monk’s ”Monk’s Mood”, a composition Magnus had listened quite intensely to for quite some time before writing this piece. It borrows its title, « Nattens skogar”, from the Swedish translation of Djuna Barnes’s novel ”Nightwood” and it is quite obviously a pun, referring to the use of nocturnal musics as a source material for the piece, and to the Skogen ensemble’s name. This version, of the rather open score, was recorded in Stockholm in april 2016. Recorded in Stockholm, april 5th 2016. Mixed by d’incise. Mastered by Giuseppe Ielasi. Cut by Adi Flück/Central dubs. A forest at night is a strange, sometimes unsettling place. Visibility, already limited during the hours of daylight, is reduced to a bare minimum; trees turn to black featureless stone, only the vaguest of outlines apparent. The sound world shifts as the day’s cast of characters give way to the night’s: insects and night predators take the place of more familiar singers in the open air concert hall. Non-human fauna become bolder and more adventurous as the courage of humans fades. In the distance, you may hear a wolf’s howling dialogue with the moon. When creating an impression of or response to such an environment, listening experience suggests that mimicking its constituent sounds is less important than providing a structure that changes in the same way as the forest at night changes. Such unfoldings are often unfamiliar or even imperceptible to humans. When I first started listening to Magnus Granberg’s “Nattens Skogar” (“Night Forests”), performed here by the composer along with Cyril Bondi, d’incise, and Anna Lindal, my initial impression was of an absence of structure, particularly compared with the returning narrative of Granberg’s “How Deep Is The Ocean, How Wide Is The Sky”. However, I slowly came to realise that the music is indeed carefully structured, but in a way that creates an open space rather than a linear path. The four musicians quietly go about their nightly routine, separately but keenly aware of each other. Meetings and coincidences occur, but the motivations for these are hidden from the sight of the human interloper stumbling through the undergrowth. How much the use of improvisation contributes to this impression is hard for the listener to discern. Granberg’s music is sometimes described as melancholy. Putting aside recent discoveries regarding the social life of trees, the inner sensations of whom must surely remain inscrutable to humans, a forest at night is neither gloomy nor happy, threatening nor comforting — any emotions present are a result of our projection onto it, rather than emerging from the forest itself, even though it often seems very much otherwise. I tend to hear “Nattens Skogar” in the same way: its intention is not to stir any particular emotional response, but to simply be what it is, however that ends up making the listener feel. The restraint and control shown by the four musicians clearly contributes to this letting the music be itself, with no instances of overplaying or hamming it up. It’s rare that I get to experience the singular pleasures of a forest at night, but “Nattens Skogar”, in its own way, is very effective in facilitating a similar mode of experience. 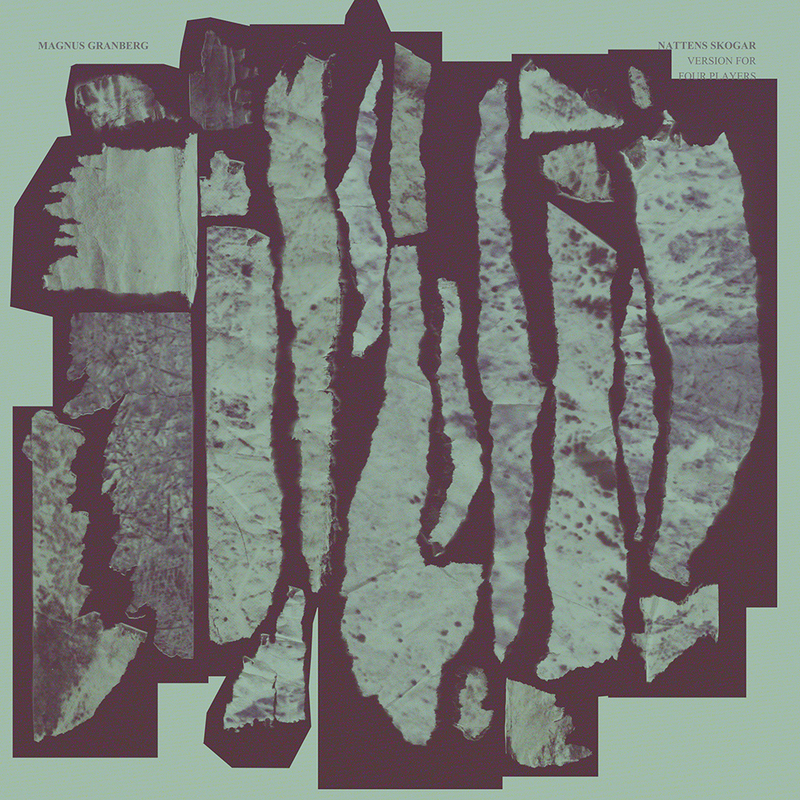 In his compositions for the Stockholm-based group Skogen, Magnus Granberg embeds improvisational opportunities within a specifically prescribed, generally unemphatic sound world. This is a guy who can place Toshimaru Nakamura into a performance of music inspired by Schubert and have it make sense. It’s all about balance, and that principal is also at work in Nattens Skrogar. Granberg has just three accompanists on this album length piece, and while its progress feels more open, there’s a similar exercise of restraint in order to accomplish a particular feel and sound. Magnus has credited “Monk’s Mood” by Thelonious Monk and Erik Satie’s nocturnes as inspiration; I’d bring up Morton Feldman as well. Each instrumental voice has plenty of space around it, which makes the moments where sounds blend feel quietly momentous. Granberg’s prepared piano playing creeps so slowly through scraps of melody that you almost forget they are there; Skogen violinist Anna Lindal’s long tones string them together like a lit-up suspension bridge spanning a misty stream at dusk. His touch is less vigorously clankety than Monk’s, but similarly effective at making you aware of what isn’t around it. The quartet’s other half, the Swiss duo of d’incise (electronics, harmonica) and Cyril Bondi (percussion, harmonica), partner with Grandberg in plunking down sounds so that you feel their ripples in time. Before this release, Magnus Granberg‘s music had only been issued on Another Timbre, a total of five albums mainly featuring the large ensemble Skogen in which the composer plays piano or clarinet. 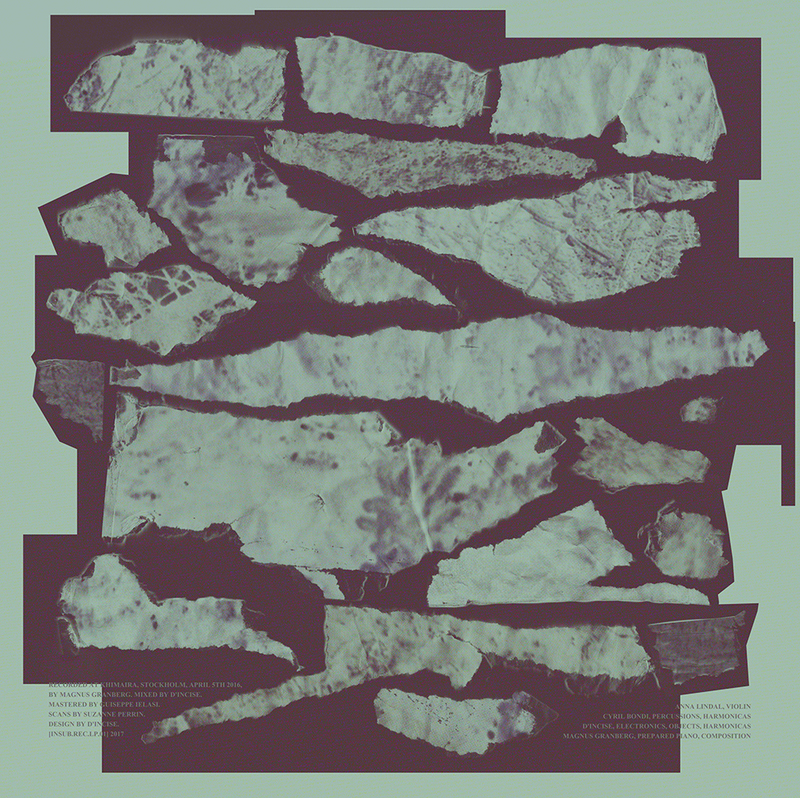 On the most recent of those albums, 2015′s How Deep is the Ocean, How High is the Sky?, a tentet playing baroque instruments included Granberg on prepared piano, his frequent collaborator Anna Lindal on baroque violin, plus the Swiss Diatribes duo of d’incise on objects & electronics and Cyril Bondi on objects & percussion. So, it is not a total surprise that this new release—issued on vinyl LP and download—appears on d’incise and Bondi’s INSUB label, with the music performed by a quartet of Granberg, Lindal, d’incise and Bondi. Recorded in Stockholm in April 2016, the music consists of two extended tracks, corresponding to the two sides of an LP, totalling fifty minutes. Apparently, the composition was originally played by Skogen (see the YouTube clip below for evidence). However, this four-player version works well, never sounding as if it lacks anything. As with past Granberg compositions, « Nattans Skogar » references other compositions, in this case Erik Satie nocturnes and Thelonious Monk’s « Monk’s Moods »; as with past pieces, the influence of such references is subtle and there are no heavy-handed quotations from the sources. Altogether, the piece is a model of economy, with plenty of space allowing the sounds of individual instruments to be heard and savoured. « Nattens Skogar » translates as « Night Wood, » which is fitting as Granberg’s music succeeds in conjuring up the tranquil ambience of its subject matter in the same way that David Tudor’s « Rainforest » conveyed its subject’s rather busier mood. With each new composition, recording and concert appearance, Granberg continues building an impressive body of work that is essential listening. Magnus Granberg Nattens skogar (version for four players) Insub records insub.rec.lp.01 2017 Quel chemin parcouru par les inséparables D’Incise et Cyril Bondi ! Nous les retrouvons en quartet avec Magnus Granberg et Anna Lindal, sur des compositions à l’origine écrites pour un ensemble suédois du nom de Skogen. Le piano de Magnus est assez central, sur des notes longues à la Eric Satie, auxquelles répondent des électroniques proches de l’orgue, dans les basses. Les harmonicas apportent une touche mélodique et lo-fi à la fois. Une électroacoustique fine perfore malgré tout un tapis de cordes grincées, serrées. Une ambiance assez américaine parfois, dans le blues rêche, l’harmonica sans doute y tient un rôle, l’ambiguité des râles sonores évoquent une fenêtre qui grince, un piano se fait cinématographique. En somme une électroacoustique européenne sans l’être et questionnant aussi le rapport du musicien à celle-ci en 2017. La manipulation, les légères percussions, me raménent au solo de L’Ocelle Mare, dans son pur côté artisanal et brut. Que l’on retrouve parfois aussi chez les productions de Corvo records. Je pense que l’on tient avec ce disque un petit labo de formes nouvelles injectées dans cette improvisation européenne. Avec un jeu sur les dynamiques plus qu’intéressant, sur les résonances à coup surs, injectant des thèmes presque trad, dans l’approche folk du terme. La participation de D’incise au trio La Tène en est sans doute pour quelque chose. Deux pièces rares qui me renouent avec le minimalisme et place le geste au centre des débats. Une excellente surprise pour deux pièces d’environ 25 minutes chacune. Une par face. These speculations are also borne out to some extent by the choice of musicians he works with. Swiss improvisers Cyril Bondi and d’incise 1, both regulars in these pages in their group work and duo work as Diatribes, are here playing percussion, electronics, and harmonicas. There’s also the violinist Anna Lindal (member of Skogen and Granberg’s other performing group, Skuggorna Och Ljuset), while Magnus Granberg plays the prepared piano. Slow-moving, extremely precise music is the result of these calibrations, arrangements, and selection of simpatico players; every understated tone and percussive beat has its place in the fabric, is presented and realised with a certain deliberation. The subtle ever-changing repetitions and pulses are clearly the result of great clarity of thought and arrangement. form playing of objects (short tones), harmonicas (long tones) and these crossing over to each other. few lines, arrows and dots; not to sound negative but to indicate how these things sometimes work. much about it and simply enjoy the result. Van een totaal andere orde is de muziek van de Zweedse componist en muzikant Magnus Granberg. Na eerdere releases op Another Timbre en met verschillende bands op onder andere Häpna en Bombax Bombax, presenteert hij hier zijn werk Nattens Skogar op het Zwitserse label INSUB.records van Cyril Bondi en D’Incise, die op deze plaat, naast Anna Lindal, ook mee spelen. Als je bekent bent met labels zoals Another Timbre en INSUB.records dan weet je dat je hier muziek kunt verwachten waar veel ruimte is voor stilte. Zo ook dus op deze plaat. De “Four Players” spelen hier prepared piano (Granberg) electronica & harmonica (D’Incise), percussie & harmonica (Bondi) en viool (Lindal). Al de instrumenten krijgen de ruimte om zich te laten horen, maar vooral ook om zich niet te laten horen. Tussen de instrumenten heerst er zo’n balans dat ze eigenlijk niet direct opvallen, dat terwijl ze er wel heel de tijd zijn. Langzaam evolueren de geluiden zich waardoor steeds nieuwe structuren ontstaan. En dat alles dus heel ingetogen. Ik vind dit zo’n fijne plaat omdat er ogenschijnlijk zeer weinig lijkt te gebeuren, maar als je heel aandachtig gaat luisteren, worden de melodieën en veranderingen daarin steeds duidelijker. Dit is wat voor mij dit soort muziek zo leuk maakt.